Oman's Ministry of Commerce and Industry (MOCI), in collaboration with UNIDO, is currently developing an industrial strategy with the vision of providing Oman with a modern and technologically advanced manufacturing base, focused on improving the wellbeing of the country. Policy Links has been working closely with both UNIDO and MOCI as a part of a broader team of experts providing key inputs for the elaboration of the 2040 industrial strategy. In this context, Policy Links attended the workshop“Building Oman’s 2040 Industrial Strategy – A stakeholder’s workshop” as technology experts, sharing findings from our work in Oman with the local industrial and government communities. To read the news feature published in Oman please click here. Policy Links, in collaboration with the Centre for Strategic and International Studies (CSIS) and the Asian Development Bank (ADB), organised three focus group discussions (FGDs) in Jakarta between 27-29 November to bring together key local industrial stakeholders to discuss specific opportunities and challenges for Indonesia’s manufacturing industries arising from disruptive technologies. The FGDs helped Policy Links to gather first-hand inputs that will inform the development of enabling policies to support Indonesia’s technological transformation. Policy Links were pleased to participate in this conference on the digitalisation of manufacturing, which this year focussed on leading change and capitalising on the benefits across industry. 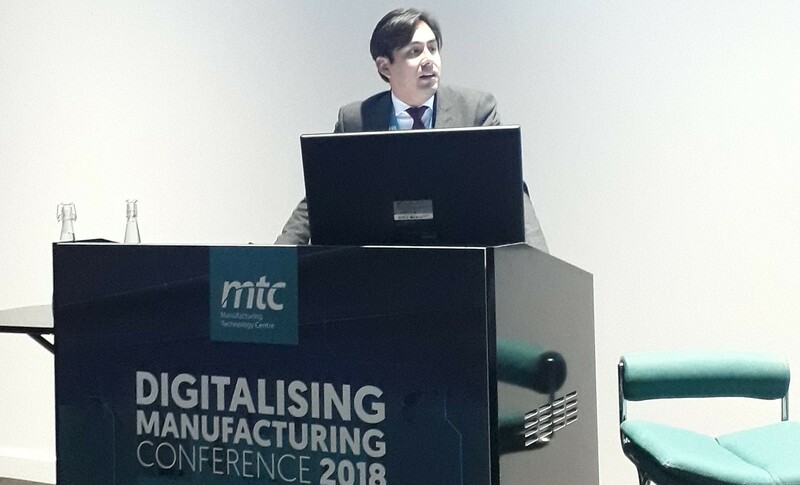 Carlos López-Gómez delivered a keynote session highligting key findings from Policy Links' recent report for Innovate UK on the potential benefits derived from the adoption of digital technologies in the manufacturing sector. Data from this study was used to inform the successful Industrial Strategy Challenge Fund bid announced in this year's budget. The conference attracted an audience of around 250 people from industry, academia and government. Other speakers included Siemens CEO and Co-Chair of the Made Smarter Commission, Prof Juergen Maier and the High Value Manufacturing Catapult's Chief Technology Officer, Prof Sam Turner. The full Policy Links report for Innovate UK can be found online here. 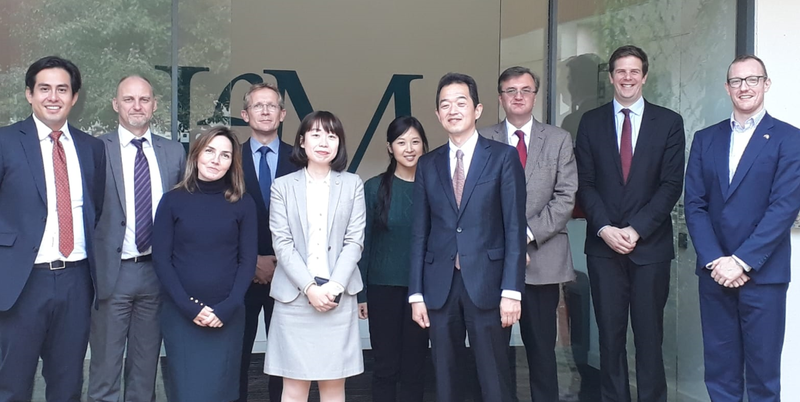 In support of the UK-Japan 'Industrial Policy Dialogue', the IfM was pleased to host a visit by key members of the working group for the Advanced Manufacturing strand. There have been ongoing discussions between the Permanent Secretary at the Department for Business, Energy and Industrial Strategy (BEIS) in the UK and the Director General of Ministry of Economy, Trade and Industry (METI) in Japan to identify potential opportunities for areas of collaboration. The working group for Advanced Manufacturing includes representatives from BEIS, Innovate UK, the High Value Manufacturing Catapult and the Knowledge Transfer Network (KTN) as well as counterparts in Japan. The group also visited the Manufacturing Technology Centre (MTC) in Coventry and the Warwick Manufacturing Group. Policy Links attended a focus group on the Impact of Disruptive Technology to Indonesian Economy hosted by the Indonesia’s Centre for Strategic and International Studies in Jakarta. Michele Palladino reported on the progress of an ongoing study by Policy Links “Supporting Technological Transformation in Indonesia”. Funded by the Asian Development Bank, the study will analyse the economic impact of disruptive technologies in Indonesia, and assess the policy implications. Policy Links is leading this collaborative project involving more than fifteen researchers from various University of Cambridge divisions including the IfM’s Centre for Science, Technology and Innovation Policy (CSTI), the Centre for International Manufacturing (CIM), the Asset Management Group, and experts on Business Model Innovation, the Department of Engineering's Use Less Group, and the Judge Business School. 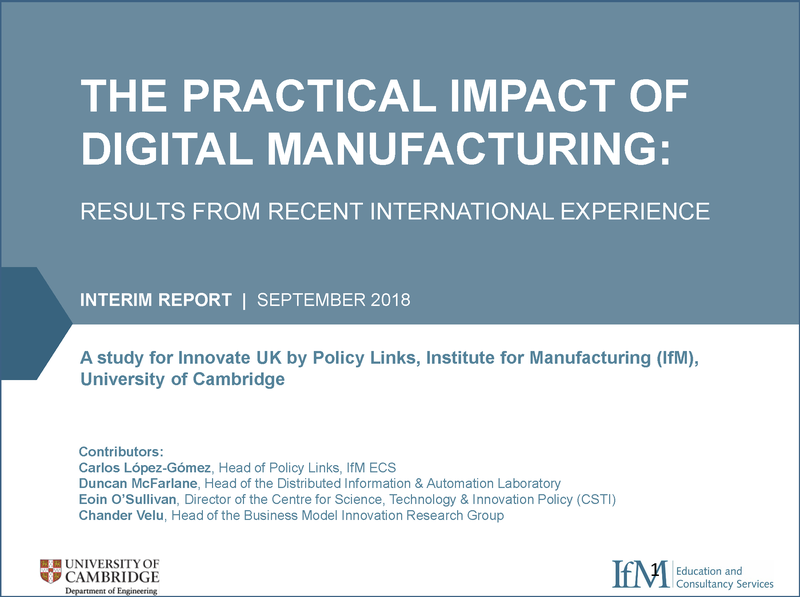 Policy Links are supporting Innovate UK to review the evidence available on the potential impact of digital manufacturing, taking examples from the UK and internationally. On 6 September a workshop was convened in Birmingham to present the evidence gathered by Policy Links and Accenture and to capture views from key stakeholders from policy and industry on appropriate indicators for the UK. Outcomes from the workshop will be used to support the Made Smarter Industrial Strategy Challenge Fund bid. IfM’s Centre for Science, Technology and Innovation Policy (CSTI), together with the ECS Policy Links Unit and the Babbage International Policy Forum, hosted a roundtable event for manufacturing foresight practitioners and policy analysts from leading multilateral organisations and international bodies. Participants included representatives from the Organisation for Economic Co-operation and Development (OECD), United Nations Industrial Development Organisation (UNIDO), the World Economic Forum (WEF), the United Nations Conference on Trade and Development (UNCTAD), as well as the UK government. Click here to read the full story. CSTI and Policy Links visited key Korean innovation agencies and manufacturing innovation centres to gain insights into the country's recent policies related to manufacturing and Industry 4.0. Specific topics discussed included: recent studies on the impact of disruptive technologies in Korea’s economy, manufacturing foresight approaches, and efforts to promote the development of ‘smart factories’ among SMEs. Innovation agencies visited included: the Korea Institute for Industrial Economics and Trade (KIET), the Korea Institute of S&T Evaluation and Planning (KISTEP), and the Science and Technology Policy Institute (STEPI). Manufacturing research and innovation centres visited included: the Electronics and Telecommunications Research Institute (ETRI), and the Korea Institute of Industrial Technology (KITECH). As part of the UK Advanced Manufacturing working group, Head of Policy Links Carlos López-Gómez joined a UK delegation to Tokyo in order to continue discussions on how the UK and Japan can work together to establish areas of collaboration in the field of advanced manufacturing. The UK delegation included senior stakeholders from the Department for Business, Energy and Industrial Strategy (BEIS), Innovate UK, the Knowledge Transfer Network (KTN) and the High Value Manufacturing Catapult as well as representatives from the British Embassy in Tokyo where the meeting was held. Senior officials from the Japan Ministry of Economy, Trade and Industry (METI), the New Energy and Industrial Technology Development Organization (NEDO) and the Robot Revolution and Industrial IoT Initiative who form part of the working group in Japan also took part in the discussion. Outcomes from the meeting will feed into formal Industrial Policy Dialogue discussions between the Permanent Secretary from BEIS and METI's Director General later this year. Following the first workshop for government stakeholders on 16 April , a second workshop was convened by Policy Links on 8 June 2018, inviting representatives from industry to directly inform BEIS considerations on supply chain capability and competitiveness, and to hear first-hand information about government plans in this area. Workshop groups discussed perceived opportunities for the UK to enhance supply chain capability as well the challenges faced by different sectors. They offered suggestions on potential government interventions and the next steps needed to address the evidence gaps. Over 25 people from manufacturing companies and trade associations took part in the workshop. The findings from both workshop discussions will help build the evidence base for future government interventions. In ongoing support of the advanced manufacturing strand of the UK-Japan Industrial Policy Dialogue, Policy Links convened a workshop to capture views from UK stakeholders on effective ‘win-win’ initiatives between the UK and Japan, practical mechanisms for bilateral collaboration and key manufacturing areas where the UK can benefit from establishing or furthering collaborations with Japan. The working group includes representatives from Innovate UK, HVM Catapult, the Knowledge Transfer Network and the British Standards Institution. Outputs from the workshop fed into the advanced manufacturing Industrial Policy Dialogue meeting in Tokyo on 27 June 2018. David Leal and Carlos López-Gómez attended the 2018 HANNOVER MESSE. The event is the 'world's leading Trade Fair' for industrial Technology with exhinitions talks and workshops covering all key technologies and core areas of industry – from research and development, industrial automation, IT, industrial supply, production technologies and services to energy and mobility technologies. The Policy Links team met with officials from UNIDO and various national and regional governments. 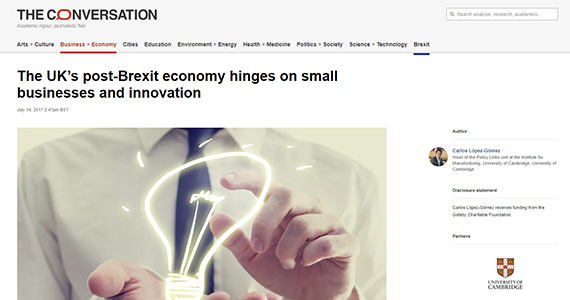 On 16 April 2018 Policy Links designed and facilitated a workshop for BEIS to stimulate discussion between key UK government stakeholders about interventions that can support UK supply chain innovation and competitiveness. The workshop brought together representatives from BEIS sector teams, the Department for Trade, several of the High Value Manufacturing Catapult Centres and Innovate UK among others. Over two half-day workshops, groups discussed UK policy priorities and gaps in current understanding with a view to produce an outline agenda for future work in this area. In partnership with Rob Phaal from the Centre for Technology Management and Eoin O'Sullivan from the Centre for Science, Technology and Innovation Policy, the Policy Links team delivered a two day open course for RTO professionals. Participants included representatives from various Catapult Centres in the UK as well as from Tecnalia in Spain and other research and innovation agencies worldwide. The course 'From Research to Economic Impact: Building effective technology and innovation strategies for RTOs' gave attendees an understanding of the latest concepts and frameworks, and practical tools such as roadmapping to support the work of innovation institutions. 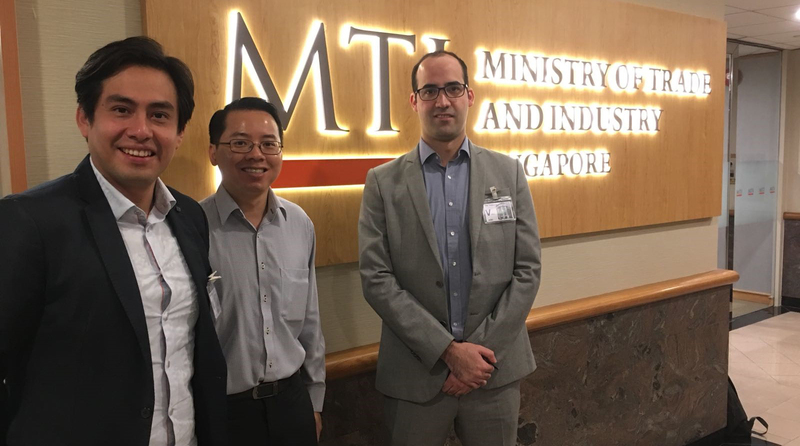 Members of the Policy Links team visited Singapore’s Ministry of Trade & Industry (MTI). Key points discussed included Singapore’s recent policies related to manufacturing and Industry 4.0, as well as co-ordination mechanisms across government. The programme 'Introduction to technology & innovation management, strategy and policy' was delivered over two days by Roadmapping and IP experts Rob Phaal and Frank Tietze from the IfM's Centre for Technology Management along with Carlos López-Gómez and David Leal from the Policy Links team. 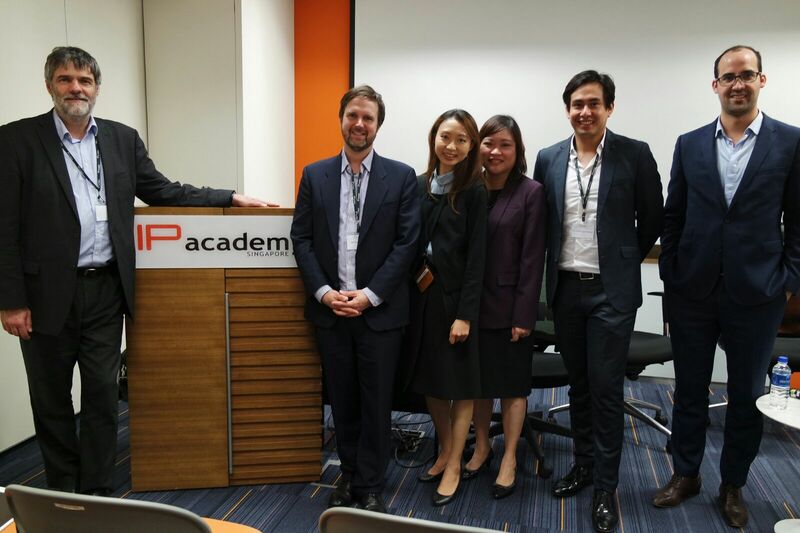 The training was delivered to around 20 participants at the Intellectual Property Office of Singapore (IPOS). On 21-22 March the European Association of Research and Technology Organisations (EARTO) held their annual conference in Oslo, hosted by their Norwegian members FFA, NOFIMA and SINTEF. The conference focussed on "Research & Innovation for Competitiveness and Sustainable Growth". The Policy Links team joined more than 250 participants from research and innovation institutions. The conference was addressed by high-level speakers from key organisations including the European Commission and OECD. Representatives from across the potato industry joined researchers from the University of Cambridge and NIAB at a reception on 21 February 2018 to celebrate their achievements in innovating for increased value capture in the potato value chain. 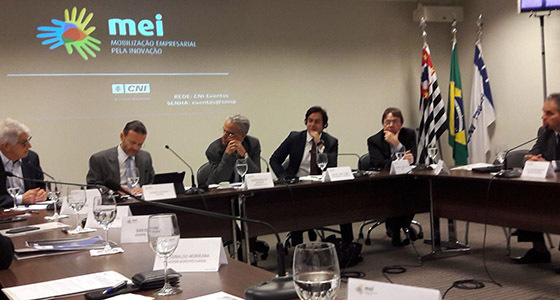 Speakers included Head of Policy Links, Carlos López-Gómez as well as others from the wider IfM. Click here to read the full story. We are pleased to announce that the Policy Links unit has been granted additional funding from the Gatsby Charitable Foundation. This second grant, which totals almost £1million, will enable the team to focus on a number of strategic projects to support industrial and innovation policy making in the UK and overseas. Policy Links was officially established in January 2017 after receiving funding of £500,000 for an initial three years of operation. This new grant will extend this by two additional years and will enable the expansion of the team. In addition to one full-time Policy Analyst position, we are glad to announce that Ella Whellams has taken on responsibility for our International and Stakeholder Engagement activities, working with the Policy Links team for half of her time. Manufacturing is changing. New technologies are radically altering not only how we make things, but how we innovate. As manufacturing systems, technologies and innovation activities become more complex, distributed and interdependent, policy makers around the world are looking for new ways to ensure national competitiveness for the so-called ‘next production revolution’. Read the full artice online here. "It is very important for the IfM in Cambridge to engage with these kinds of initiatives"
International Policy Approaches to Strengthening Value Chain Capabilities,” was launched at the Institute for Government (IfG) in London on 15 December 2017. 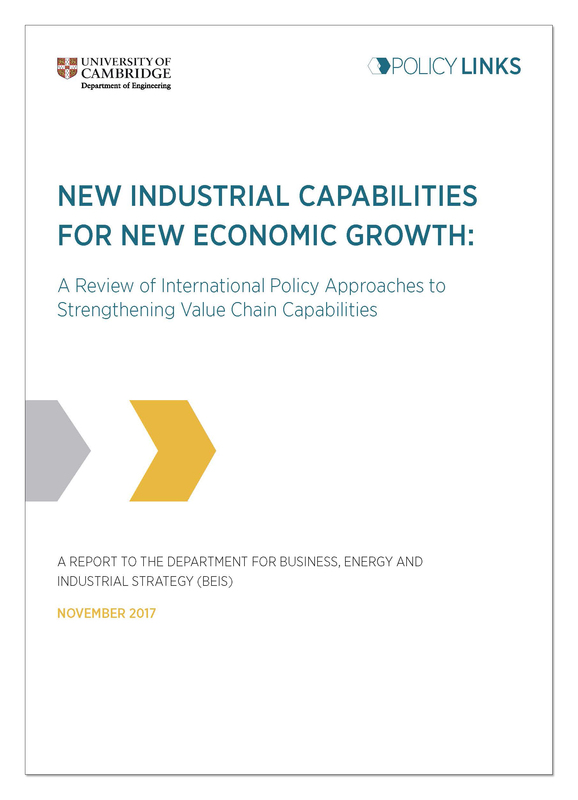 Commissioned by the Department for Business, Energy and Industrial Strategy (BEIS), the report analyses the role of value chain capabilities in underpinning industrial innovation and competitiveness. It draws from an extensive review of initiatives and programmes found in selected competitor countries. Four key opportunity areas for increased value capture in the UK are identified, and implications for effective policy implementation discussed. The launch was attended by representatives from various teams at BEIS as well as other government agencies and institutions including the Government Office for Science, the Department for International Trade and the National Physical Laboratory (NPL). 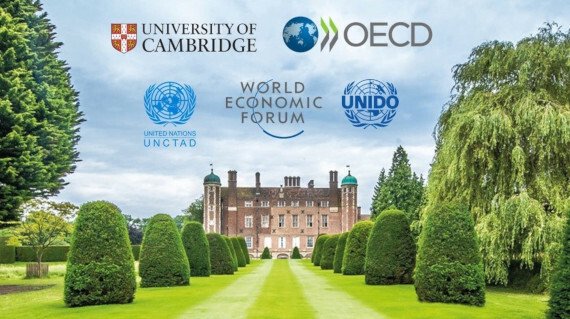 Head of Policy Links, Carlos López-Gómez attended a high-level roundtable chaired by Lord Prior from the Department for Business, Energy and Industrial Strategy and UKRI's Sir Mark Walport. The aim of the meeting was to gather thoughts on the key future trends in global industries and technologies of particular importance to the UK in the context of Industrial Strategy. Other attendees included senior policy offcials from UK government departments and agencies as well as representatives from Trade Associations and UK Universities. On 21 September, Policy Links convened the “UK-Japan Manufacturing and Innovation Policy Workshop”, bringing together senior officials from ministries and innovation agencies in UK and Japan. Held at the British Embassy in Tokyo and supported by the Science and Innovation Network (SIN), the workshop set out to support the advanced manufacturing stream of the UK-Japan Industrial Policy Dialogue, established in a joint statement by Prime Ministers Theresa May and Shinzo Abe in August 2017. As result of this consultancy activity, a report was prepared by Policy Links (IfM ECS) for the Government of the Republic of Trinidad and Tobago (GORTT), on behalf of the Inter-American Development Bank (IDB). The project consisted of five work phases involving a comprehensive review of international literature and previous policy studies, analysis of economic data, and a structured consultation process with local stakeholders from industry, academia and government through interviews, company visits, and four roadmapping workshops. The main output of the project were five roadmaps that present an initial overview of the potential missions, innovation functions and services that could be pursued by local Centres of Excellence to support innovation and industrial growth in key economic specialisation areas beyond the hydrocarbon sector. Policy Links and CSTI hosted a halfday workshop on 11 August to identify how the team’s work can help address ‘knowledge needs’ of UK Government agencies. The session was attended by officials from Innovate UK, EPSRC, High Value Manufacturing Catapult, and various teams at the Department for Business, Energy and Industrial Strategy (BEIS). Eoin O’Sullivan and Carlos López-Gómez offered an overview of CSTI and Policy Links’ research work and training offering, and gathered feedback about the type of materials that can be useful in policy makers’ day-to-day work. The workshop was kindly hosted by the Institute for Government (IfG), CSTI and Policy Links’ sister organisation also supported by the Gatsby Charitable Foundation, at its prestigious facilities in London. Policy Links was awarded a contract by the Department of Business, Enterprise & Innovation in Ireland to conduct a study to determine the policy implications for Ireland from the impacts, opportunities and challenges arising from the digitalisation of the manufacturing sector. The study is being conducted by the Policy Links team with academic support from CSTI. Head of Policy Links, Carlos López-Gómez and CSTI Director Eoin O'Sullivan met with Alex Jones, Director of the Industrial Strategy team at the Department for Business, Energy and Industrial Strategy to discuss emerging industrial strategy approaches in the UK. The department are currently analysing feedback to their green paper: Building our Industrial Strategy. Head of Policy Links, Carlos López-Gómez and Director of CSTI Eoin O'Sullivan met with Professor Ben Wang at the IfM to discuss recent developments in advanced manufacturing research policies in the US and UK. Prof Wang also provided updates on new initiatives in Georgia Tech to support the application of research outcomes in industry. The meeting was joined by others from the IfM including Tim Minshall, Duncan McFarlane, Michael De Volder and Bill O'Neill to share common research interests around scale-up. Carlos López-Gómez and Ella Whellams from Policy Links carried out interviews with government agencies and research institutions in Japan as part of an evidence gathering exercise looking at international approaches to industrial strategy. The programme included meetings with senior officials from the Ministry of Economy, Trade and Industry (METI) and the New Energy and Industrial Technology Development Organization (NEDO). The team also worked on preparation for their forthcoming workshop on manufacturing and innovation policy which will be held in Tokyo in September. 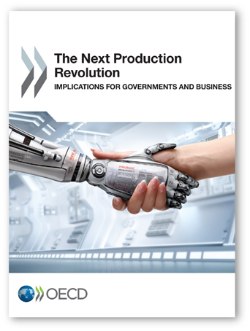 Carlos López-Gómez and Eoin O'Sullivan have written a chapter for the OECD's recent publication: The Next Production Revolution: implications for Governments and Business. The chapter reviews international emerging manufacturing R&D priorities and policies for the next production revolution. Click here for the full news article. Click here to read the publication (and chapter 10) online. Head of Policy Links, Carlos López-Gómez and CSTI Director Eoin O'Sullivan met with Leslie Evans , Scottish Government's Permanent Secretary to discuss opportunities for industrial innovation for Scotland as well as internationalising Scotland and its economy. In response to the Government's green paper , Policy Links have submitted an evidence paper outlining their recommendations for implementation of the industrial strategy. The paper has been accepted by the Department for Business, Energy & Industrial Strategy. This joint report by the Institute for Manufacturing (IfM) and the United Nations Industrial Development Organization (UNIDO ) looks at Emerging Trends in Global Advanced Manufacturing with specific focus on the megatrends shaping the future of manufacturing. Download the full report here. 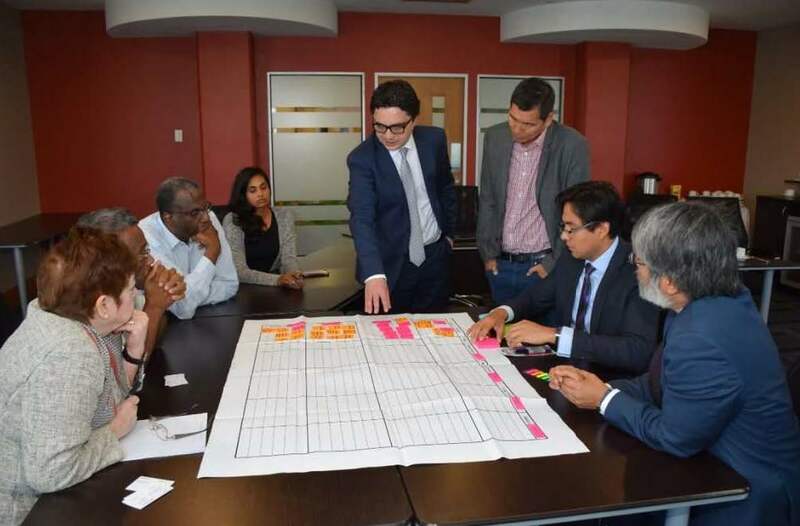 IfM ECS's Policy Links team has been working with the Government of Trinidad and Tobago and the Inter-American Development Bank (IDB) to develop a strategic roadmap for productive development policy in Trinidad and Tobago. Click here to read the full story. 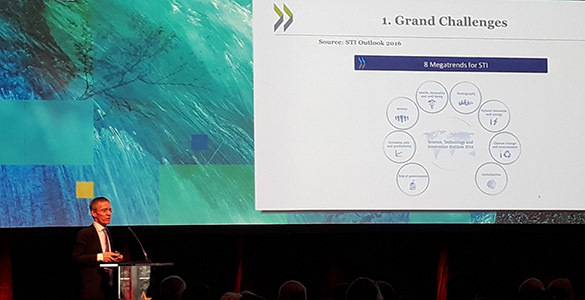 Policy Links attends ONS conference on "Economic Statistics in a digital age"
This two day conference provided an opportunity to explore issues surrounding the measurement of the modern economy, and influence the direction of development for official Economic Statistics. This two day programme was developed in consultation with the Department for Business, Energy and Industrial Strategy (BEIS). Attendees included members of BEIS involved in developing the UK’s Industrial Strategy as well as senior representatives from Innovate UK and the High Value Manufacturing Catapults. Carlos Lopez-Gomez, Head of Policy Links chaired a session on collaborative development at the first Royal Academy of Engineering 'Frontiers of Engineering for Development' conference. For more information about the conference sessions click here . Andy Neely, Head of IfM and Carlos Lopez-Gomez Head of Policy Links have written an article for the Prospect report launched today at the House of Commons. Read the full story here. Policy Links and CSTI received visitors from the Japan Science and Technology Agency's Center for Research and Development Strategy (CRDS ) and the First Secretary for Science and Technology from the Embassy of Japan in the UK. Discussion topics included industrial strategy, digitalisation of manufacturing and opportunities for collaboration. Policy Links have submitted a paper to the select committee for Business, Energy and Industrial Strategy for their call for evidence on industrial strategy. The paper has been published here . Policy Links and CSTI hosted the second Babbage Symposium in September 2016. 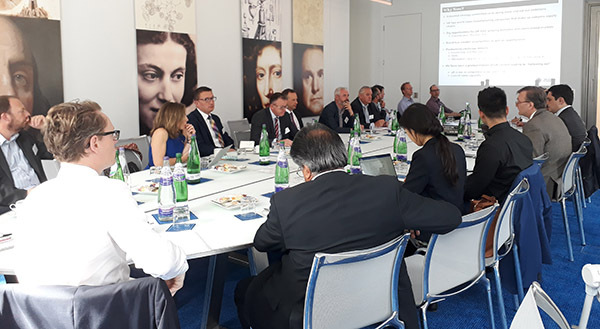 A select group of leading international experts came together to look at aligning engineering and economic perspectives on industrial innovation and competitiveness. CSTI Director, Eoin O’Sullivan was invited to attend a roundtable with Philip Hammond, Chancellor of the Exchequer at 11 Downing Street to give his views on disruptive technologies. To read the press release, please click here . CSTI and Policy Links held a ‘smart specialisation’ workshop for the agri-tech community in the East of England designed to identify the distinctive strengths of the region as one of Europe’s leading agri-tech clusters. It is intended that outputs from the workshop will inform government thinking on 'smart specialisation'. Professor Sir Mike Gregory, Dr Eoin O’Sullivan and Dr Carlos Lopez-Gomez from CSTI led the event, titled: ‘UK-US workshop on manufacturing and innovation policy: practices and lessons from advanced manufacturing innovation institutes’. For more information, please click here. Policy Links and others from IfM ECS worked on this project with the government of Yucatan, Mexico to help uncover strategic options for industrial growth, job creation, and improvement of the state's competitiveness as a manufacturing location. Read the project report here.